You are here: Home / Beginner’s guide: how to get healthy? My name is Yossif. I’ve lost over 100 pounds. Read about my weight loss story here. Don’t believe me? Check out my amazing weight loss in pictures. 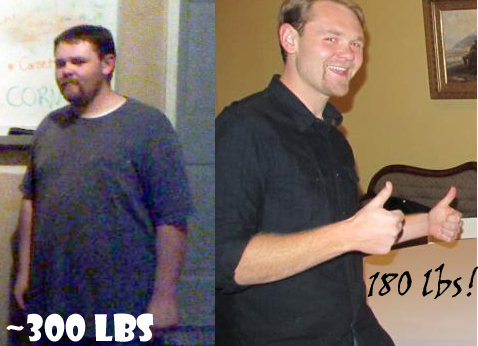 I didn’t drop over 100lbs by accident, I know a thing or two about how to get healthy. What is Angry Nutrition and what is my mission? My mission to help people. I never sugarcoat the facts and I don’t mess around. This is why I got results. I got ANGRY and I made a change. If you want results, you gotta get angry! How to get healthy? Keep reading. So, how to you get healthy exactly? There is no one-size-fits-all solution to health problems. Depending on what you want, I can give you a starting point. 80% nutrition and 20% exercise is the magic ratio. What you look like and how you feel is mostly what you put into your mouth. Are you obese and want to lose weight? I strongly suggest you take a look at my FREE eBook if you want to learn more about carbohydrates, proteins and fats. It is crucial for weight loss! Using Paleo to limit fake food and work with your ancient genetics is an excellent starting point. I personally lost a lot of weight and felt x100 better after a mere month of acting like a caveman! Of all the nutritionally based fat loss techniques, the Ketogenic diet is the most powerful. By limiting carbohydrates, you can force your body to burn fat for energy rather than sugar. It helped me lose a ton of weight and completely wiped out my ravenous daily hunger. It teaches your body to use stored fat as energy ALL THE TIME! Exercise-wise, don’t worry about joining a gym or paying for expensive equipment. Just get out walking as much as you can. Contrary to popular belief, you can burn fat faster with simple walking more than running! Once you get healthier and learn to control your hunger with proper nutrition, simplify your life with intermittent fasting. I do it almost every day! It’s very liberating and helps keep my weight low. Plus, it helps me stay energetic and focused! What is the best way to get strong and fit? If you can work out, get into weight lifting. It is superior to most forms of exercise. Otherwise, if you like to run, go ahead and do that. Just do something to get your body off the couch and moving. As your body adjusts to the new nutritional intake, it will slowly start to feel lighter and you’ll feel much better and have more energy. You don’t need a gym to do it. Do you want to build huge muscles and lose fat AT THE SAME TIME? Weight lifting via Leangains protocol is a great way to do it. I will go into more details on the how and why soon. Are you sick or weak all the time? Do you have chronic sickness, digestive problems, or mental fog? Give the previous suggestions a try to focus on your gut and immune system health. This can be done by making cheap and easy foods at home. Kefir, sauerkraut and kombucha are good starters. This is barely scratching the surface, but I will add more very soon. Look for videos, podcasts, and eBooks. I will go into details about supplementation eventually, but until then you should check out the Examine.com Supplement-Goals Reference Guide. It’s everything you could possibly need to know about all the major supplements. It’s tough to decide what to spend your hard earned money on, so be sure to research it beforehand. I have a very low tolerance for b******t. I hear a lot of pseudo scientific claims and crazy theories. Most things DON’T work, but if I find something that works, I’ll let people know. I personally try to research and experiment on myself before I suggest thing for other people to try. These are what work for me, but I’m just one person. I am here to teach people about proper nutrition, the best ways to lose weight and keep it off, and how to exercise efficiently. More than anything, I want to show people how to be healthier than ever and take back control of their lives. I did it and it is the greatest accomplishment I have ever experienced. I want to show you how to do the same. I emphasize using real food that anyone can buy from the store for cheap. You don’t need to spend a ton of money to lose weight and feel good. You need to understand what is good and why, and what to avoid and how it can kill you. If you do it for long enough, you’ll see results. Give me 30 days and I can change your life. If you have any health questions, email or contact me via social media! Like me on facebook or Google+ and follow me on twitter! I post daily hints and tips for staying healthy and I love motivational quotes to keep on track. With my help, I want to change your life for the better!